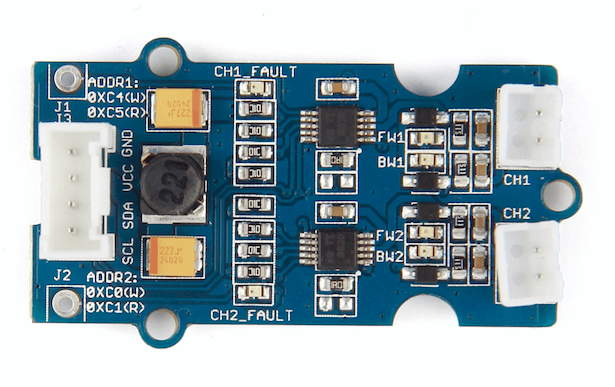 This Grove - MIni I2C motor driver includes two DRV8830. The DRV8830 provides an integrated motor driver solution for battery-powered toys, printers, and other low-voltage or battery-powered motion control applications. 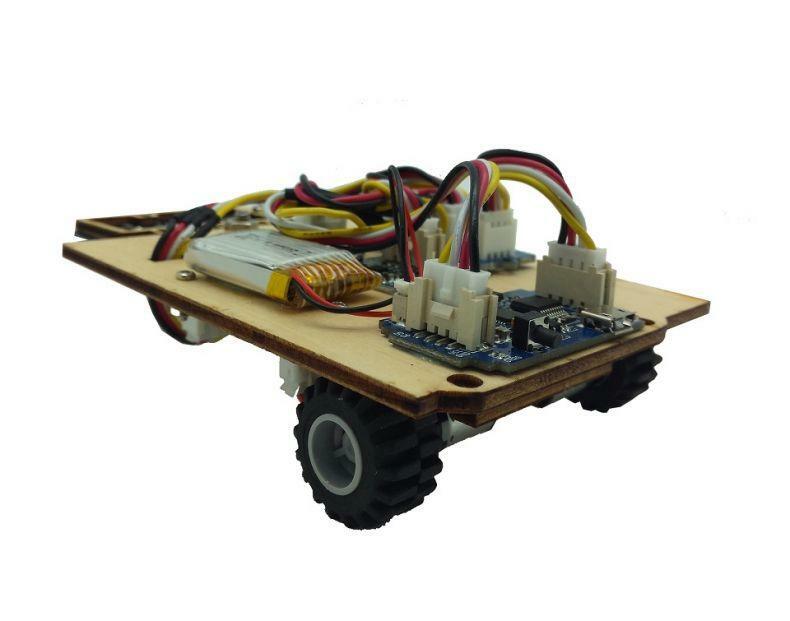 The module has two H-bridge drivers, and can drive two DC motors or two winding of stepper motors, as well as other loads like solenoids.It requires an onboard 5V voltage regulator which can power the I2C bus. All driver lines are diode protected from back EMF.It features two LEDs for fault indicator and four LEDs to indicate which direction each motor is running. GROVE system plug and I2C interface enables you to daisy-chain the driver with many other devices. This motor driver can be used to drive any brushed electronic motor as long as it doesn't consume more than 1A at 5v. Two motors can be driven simultaneously while set to a different speed and direction. The speed can be set fully proportional and is controlled by I2C command. Here are some projects for your reference. Make it NOW! Make it NOW! Grove Interface - Grove products have a eco system and all have a same connector which can plug onto the Base Shield. 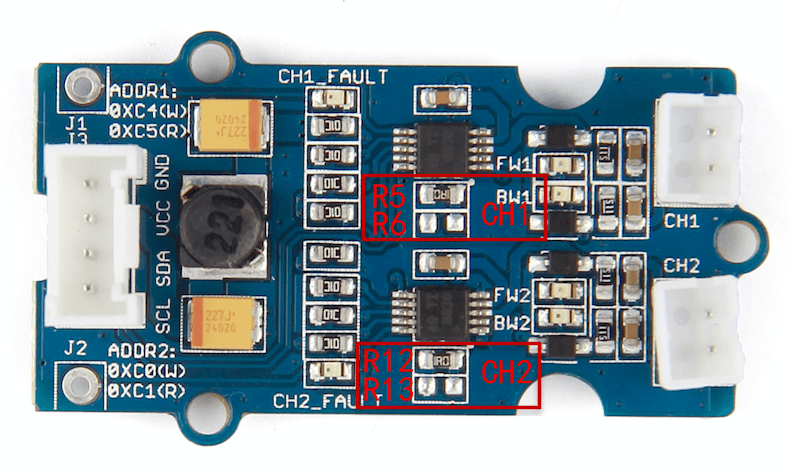 Connect this module to the I2C port of Base Shield, and then it can work well with Arduino. However, you can also connect Grove - Mini I2C Motor Driver to Arduino without Base Shield by jumper wires. Maximum working current of each channel must be less than 1A. So the minimum value of resistor soldered to the reserved pad should not less than 0.2 Ω. 0 - You need a solder iron, just unsolder two sides of the jumper. 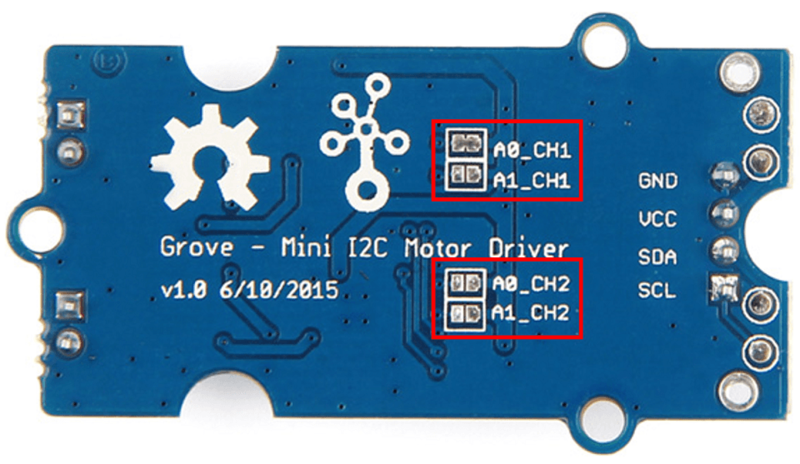 The library of Grove - Mini I2C Motor driver is dependent on the default address. Now, let us begin to use the Grove - Mini I2C Motor Driver. Now we are making a demo for Grove - Mini I2C Motor Driver v1.0 which require following modules. Seeeduino Lite is compatible with Arduino. You will need a Grove Base Shield to connect the Grove easily. 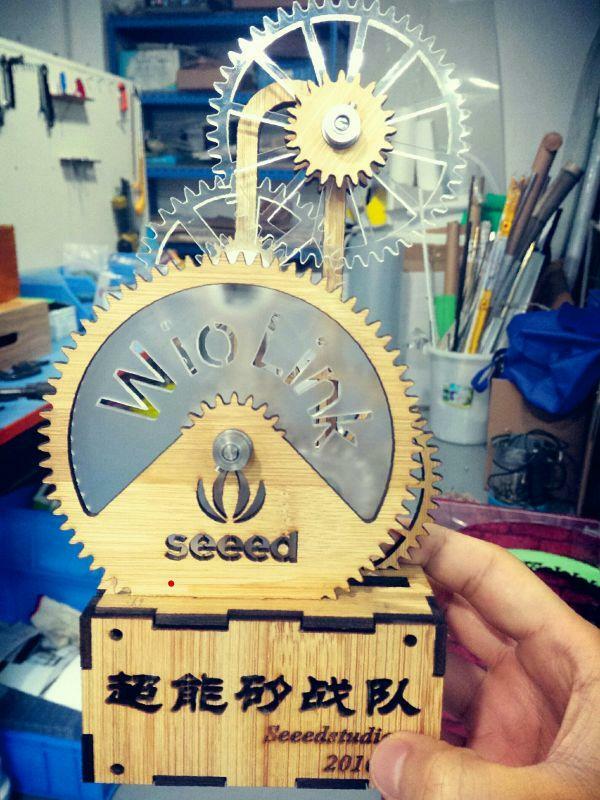 If this is your first time using Arduino or Seeeduino, Please put hand on here to start your Arduino journey. 2 * DC Motor 2V-6V - connnect to CH1 & CH2 Output connector. The Grove - Mini I2C Motor Driver can control motor which is based on the chip DRV8830. The DRV8830 is not just a dual motor driver, it is a dual H-bridge. An h-bridge is basically a specific setup of transistors that allow you to switch direction of current. You can use your Arduino to make them spin at any speed. Because the module has 2 H-bridges, you can not only make a robot go forwards and backwards, but also turn around by having each wheel spin in a different direction. Connect Seeeduino to computer use a micro USB cable. 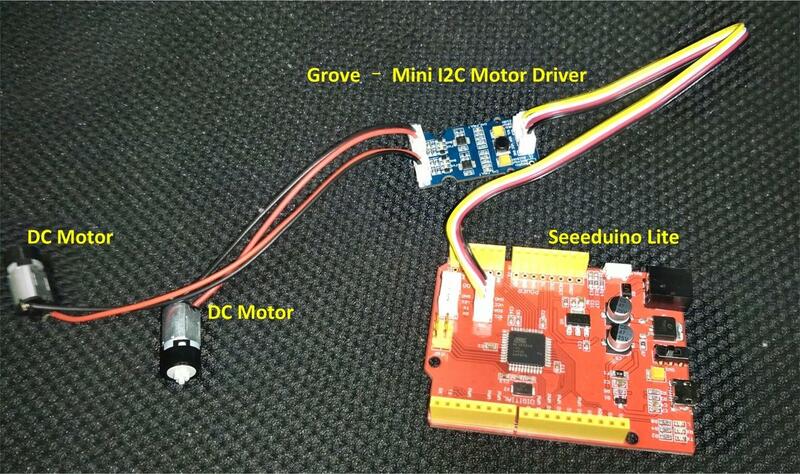 Now, let us use the Grove - Mini I2C Motor Driver to control two DC motors rotating in the positive or opposite direction. 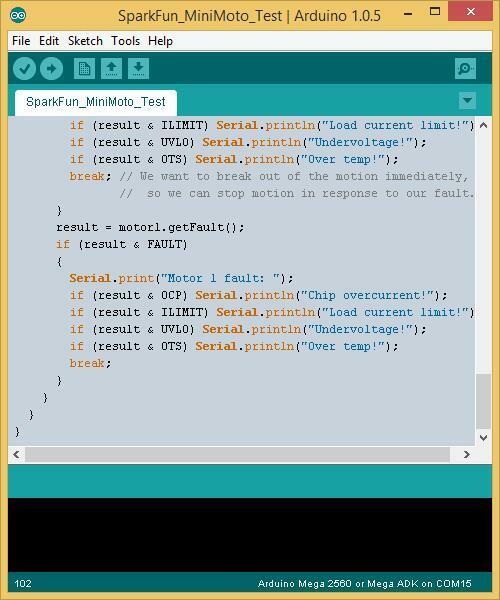 Given below is an example program to be used with an Arduino. The code for this is very basic, but you can also change it and do it your own way. Code developed in Arduino 1.0.5, on a Fio classic board. Now click Upload(CTRL+U) to burn testing code. Please refer to here for any error prompt and you can also add comment on community. After upload is complete, the motors will rotate in the positive or opposite direction in cycle.